With all of the populations spawning consistently and the mass mortality (hopefully) subsided, we started tanking about a “salinity challenge” experiment to see how larvae from the three populations respond to different salinities. A number of different techniques have been developed to measure salinity, and with these different units of measurement. One common way to express salinity is in parts per thousand (ppt)- harkening back to when titration techniques were used to measure the concentration of certain ions in seawater. 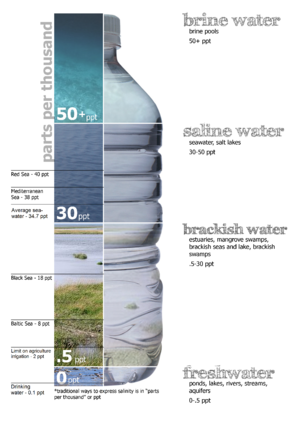 Most seawater is considered to be around 30-32 ppt. In estuaries and bays with freshwater input (the favorite homes of oysters!) this can go much lower. I found some information about salinity during the summer in Puget Sound, but not much (if you know of any good datasets, please let me know!). 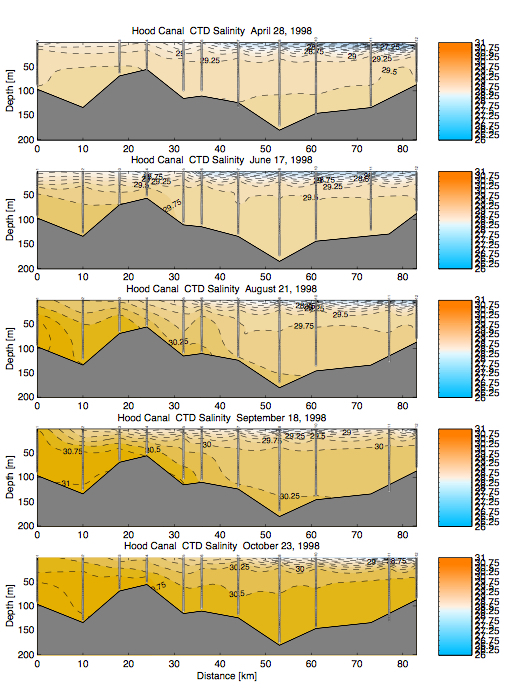 One review of Hood Canal studies in 1998-2000 included some figures that show surface salinities around 26 ppt in the summer. Warner, M.J., Kawase, Mitsuhiro, and Newton, J.A., 2001, Recent studies of the overturning circulation in Hood Canal, in Proceedings of Puget Sound Research, February 12-14, 2001, Bellevue, Wash., Puget Sound Action Team, Olympia, WA, 9 p.
We decided to do a trial experiment on Wednesday where larvae from each population are exposed to either 30, 25, 20,15, 10, 5, or 0(freshwater) ppt for an hour. After which they are all put back into 30 ppt seawater and left for a day. Ryann, one of the PSRF interns, will be helping me plan and execute these salinity experiments. Steven came out to help today and brought a handsaw to help with the PVC tiles. Ironically, we found a tool in the warehouse that worked even better than what he brought, but either way we finished up making the 10cm x 10 cm tiles. There were very few larvae from Fidalgo Bay, so we set up our trial experiment with just Hood Canal and South Sound larvae. 7 salinities (30, 25,20,15,10,5,0), 700 larvae per silo, and 1 replicate per treatment. The experiment was set up at 2p and at 3pm we moved the silos into 30 ppt seawater with ~40,000 algae cells per mL. Water temp was 19degC. Ryann and I took a few mL with larvae out of the salinity experiment silos for her to look at under the microscope. I’ll post her notes when I get them, but at 0 ppt all larvae looked at from both pops were dead. At 5 ppt there were some still alive, and she noted that the Hood Canal larvae looked hardier. After 15 ppt there was no noticeable mortality and larvae from both pops seemed active in general. We cleaned out those silos and then set up the full scale salinity experiment. 15 silos for each population were put in beakers with 30 ppt seawater and ~40,000 algae cells/mL of Reeds Algal Paste. Larvae from all families in a population were pooled together and then based on the drop counts ~700 larvae were added to each silo. Larvae were measured out with a graduated cylinder, with mixing in between and during the pours from beaker to cylinder. There is still likely to be some variation in the number of larvae per silo, but larvae will be counted at the end of the experiment when comparing live vs. dead.